One of my favorite meals is champagne and pommes frites so I guess it's no surprise I ended up in France. Really good pommes frites, the kind that are crispy on the outside, creamy on the inside and not greasy, are extremely difficult to perfect as I can attest to destroying thousands in my humble culinary career. 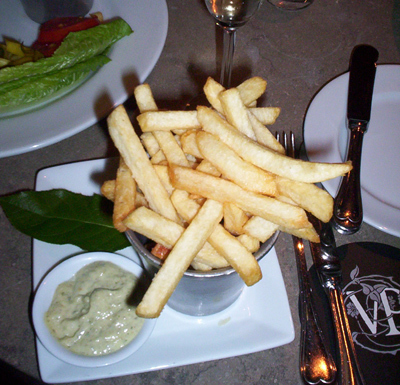 So when I come across perfect pommes frites, it's certainly cause for celebration. Last week at The Village Pub was just such an occasion..... Click here to read the entire indulgence.